Freshman painting and graphic design major Sarah Foote with her Pop Can Reggie at East Campus. It’s amazing what you can accomplish with a roll of chicken wire, hundreds of aluminum cans, some PVC pipe, and 10 straight hours of hard work by a bunch of Honors students. 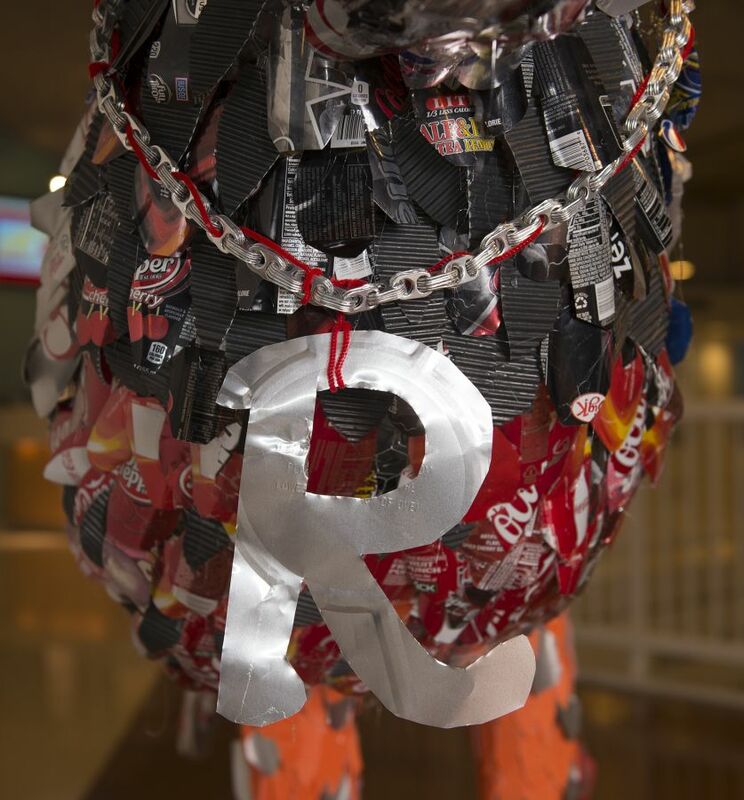 That’s what went into Pop Can Reggie, a new sculpture that’s now perched inside Vrooman Center on East Campus. The idea came from freshman painting and graphic design major Sarah Foote, who lives in Manchester Hall. She pitched her plan to her resident assistant (RA) as a way to show Redbird pride at Homecoming. 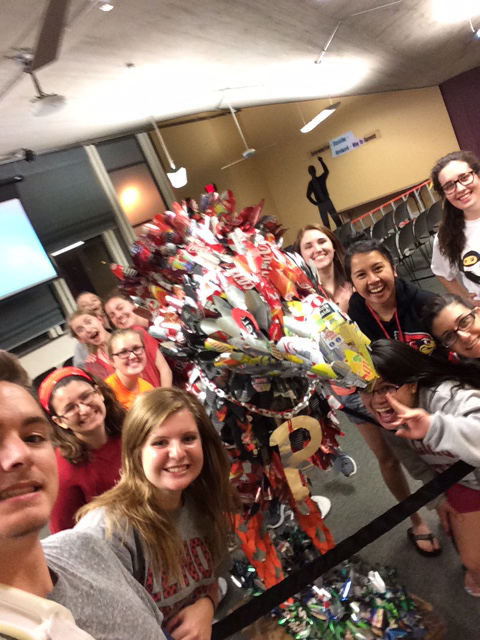 Just before 2014’s Homecoming weekend, Pop Can Reggie made its debut. It’s been popping up all over social media ever since. Foote and her neighbors from her all-women’s Honors floor. Foote worked on Pop Can Reggie with around 15 other students from her all-women’s Honors floor in Manchester Hall, one of Illinois State’s Themed Living-Learning Communities (TLLCs). They collected cans from Manchester and Hewett halls, and ran over to Home Depot to buy the chicken wire. One night during Homecoming week, they spent 10 straight hours piecing it together in the Escalante Room at East Campus, with Foote supervising the creative side. The PVC pipe (duct-taped together) makes up Reggie’s bones, with chicken wire serving as the “skin” and aluminum “feathers” attached with hot glue. Even before the sculpture, Foote was no stranger to Reggie Redbird. Her family has deep Illinois State ties; her parents, Angela (Blume) Foote ’83, MBA ’84, and James “Al” Foote ’83, met at Illinois State as students. Her brother, Brandon Foote ’13, and several aunts and cousins are also alumni. A closer look at Pop Can Reggie. Beyond her Redbird roots, Sarah chose Illinois State for its well-regarded art program. Her ultimate goal is to work on Walt Disney’s Imagineering team, partially inspired by Disney artist and School of Art alum Chris Chapman ’03, who was featured in ISU’s alumni magazine in 2013. Foote hopes to start with an internship and build from there. “I’m just keeping my nose to the grindstone, and working hard to make that happen,” she said. Read more about Foote in the November 2014 edition of the TLLC newsletter.